Are hydrogen vehicles the answer to EV woes? With sales of petrol and diesel cars set to be banned in the UK by 2040, the spotlight has turned on electric vehicles as the alternative. But there is another zero emissions fuel - hydrogen. Hydrogen fuel cell cars are nothing new of course. We drove the Honda FCX Clarity in 2010, but there's very little mention of this alternative fuel source in the mainstream media. Yet we constantly hear about EVs as the only real alternative to conventional petrol and diesel engines. Despite all the noise made, the buying public has yet to be convinced it seems - less than 1000 electric cars were sold in the UK in the first two months of 2018. Why? Well electric cars will not work for everyone. Partly due to their maximum range - for example a Volkswagen e-Golf covers 186 miles on a single charge in ideal conditions - but also a lack of coverage when it comes to charging points in the UK. But perhaps the biggest barrier is convenience. Most people want to fuel their car once a week and forget about it. The idea of having to sit at a motorway services for a couple of hours while your car charges is not that appealing for most. It's a big step change for a nation used to putting in 20 litres of unleaded to keep them going. So on paper, hydrogen power looks very appealing. A hydrogen car is essentially an electric car, but doesn't require plugging in and charging. Instead the power is generated by the fuel cell. In place of a petrol tank there's a high-pressure hydrogen tank and this hydrogen is combined with atmospheric oxygen to generate electricity. The fuel cell is really a tiny electric power station, generating its own electricity rather than through a plug-in system. As a result there are no CO2 emissions - instead the only by-product is water. Honda says the FCX Clarity is three times more efficient than a petrol-engined car. But the real appeal is that refuelling a fuel cell vehicle is like fuelling a normal car and takes just a few minutes. 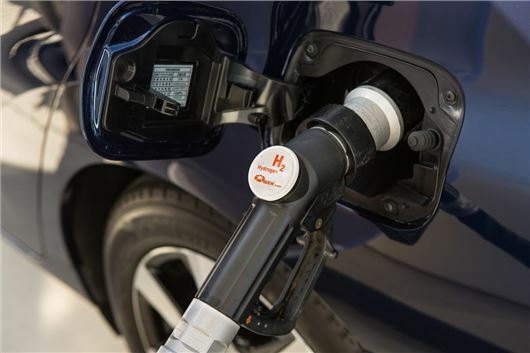 At the latest Future of Technology seminar organised by the Advanced Propulsion Centre (APC) and Innovate UK, industry specialists argued that hydrogen is ready to challenge batteries as the zero emissions fuel of the future. However, FCEV sceptics' argue that they’re less efficient than electric vehicles. Hydrogen doesn't occur naturally, it must be extracted, then compressed in fuel tanks. It then has to mix with oxygen in a fuel cell stack to create electricity to power the car's motors. Tesla's founder and CEO, Elon Musk, previously said, "Hydrogen is an energy storage mechanism, not a source of energy. If you get that Hydrogen from water, you’re splitting H20, and electrolysis is extremely inefficient. It makes no sense." Many energy experts point to the energy loss in this process when compared with an electric car, in which the electricity comes straight from a battery pack. That's true to an extent, but for makers such as Toyota, hydrogen will complement electric power rather than replace it. Hydrogen fuel cell cars utilise a lithium-ion battery, just like EVs. However, since it is only used to boost acceleration and not for primary propulsion, the battery can be much smaller. "Unlike batteries, FCEVs are already proven in rail and truck applications as well as passenger cars. You could run all the trains in Wales using hydrogen produced from just one medium-sized wind farm," said John Maddy of the University of South Wales. Work is also underway to obtain hydrogen from biomass, rather than seperating it from natural gas, a process that would significantly cut the life-cycle emissions from hydrogen to around 60g/km CO2. This is below the level that EVs will achieve, even when electricity is sourced from renewable sources, because of the environmental costs of battery production. Toyota UK's alternative fuels manager, John Hunt, said that the main barriers to sale was the cost of the complete fuel cell system, especially the fuel storage tanks and the availability of the gas. "There's 1TWh of unused power generating capacity available in the UK. This could produce enough Hydrogen to fuel 90,000 FCEVs for 12,000 miles per year each, with none of the load balancing problems that are being predicted for battery electric vehicles," said Hunt. Yet, not everyone agrees. Dr. Colin Heron, chief executive of Zero Carbon Future, asked: "Why waste electricity and money making hydrogen when you could just put it into a battery and go?" Presenting a range of calculations, Heron claimed that a fuel cell electric passenger car is "three times the price to buy and five times the cost per mile to run." He also suggested that by the time EV batteries have finished their second life – potentially in around 15 years – technologies will have been developed that allow them to be recycled and the rare metals recovered, eliminating one of the major environmental concerns around the technology. Currently the only hydrogen fuel cell vehicle on sale in the UK is the Toyota Mirai. It's priced at £65,000 and there are only a handful of hydrogen filling stations. Will we see the price come down as technology develops as with EVs? And will there ever be a proper network of hydrogen pumps and filling stations? Let us know what you think. My ideal would be to generate hydrogen at home from windmill and solar and then run car off that. Long term my gut feeling (and that's all it is) is that eventually hydrogen fuel cell will take from pure EV. ITM Power is making units that store hydrogen to be used in transport right now. They have just won over £4M to build four new stations alongside petrol and diesel in the UK. It's clean and can be made from excess green energy, stored safely and delivered to cars in minutes just like petrol. The lead developer at Lexus said that they have been investigating battery powered cars (hybrids) for the past 15 years and if that was the solution they would have found it by now. Fuel cells are the only way forward but I suspect political/economic reasons are holding it back. In my opinion the high expectation on EVs are a result of goverments tryng to become greener even when it's impossible. Like I red on HonestJohn about the impossibility to produce energy to support all cars in England being electric. And EVs are not green at all, if we consider also the building and disposing of the batteries, something that should never be separated from any analysis of EVs. H2 seems to be greener and easier to implement in a really big scale, and that's with an extremely small investment in R&D compared to EVs. We should start acting green, as opposed to buying cars that pollute like petrol ones but only give us an untrue feeling of responsibility based on ads. Where will the hydrogen come from??? If it is derived from fossil fuels (as most is currently), it's not environmentally friendly. If it's produced through electrolysis, there is enormous energy loss (Also not environmentally friendly). Currently, the Achilles heel of EVs is the batteries which are heavy and expensive. However there are plenty of other battery chemistries (lithium sulfur, for example) under development which will be lighter, cheaper and more environmentally friendly. Aside from current batteries, EVs are inherently cheap,efficient, simple and very reliable. Automakers recognize this and it scares the crap out of them. If cars are simple, it lowers the barrier for new competitors to enter the market and reduces margins. That's why they are so desperate to develop something complicated to replace the ICE. Something like hydrogen fuel cells. Media should know better than to be willing dupes in this charade. Powerhouse Energy (PHE), a small British company, are going to have their first commercial Ultra-High Temperature gasifier in operation this year, know as the G3. This unit can gasify 25 tonnes of virtually any organic waste per day with no toxic emissions (it does not have a chimney stack), to a produce a syngas that when converting plastics and tyre can contain up to 70% hydrogen. This hydrogen is then separated and cleaned to 99.999% purity for use in hydrogen fuel cell vehicles or stationary fuel cells. Each G3 can produce up to 1.5 tonnes of hydrogen per day depending on the feed-stock which could support up to 3,000 cars. The remaining syngas is combusted in a gen-set to produce up to 31MWh's per day with the whole process emitting about 1 tonne of CO2 per day (steam methane reformation produces about 16 tonnes of CO2 per tonne of hydrogen). There is potential with this method of hydrogen production to make hydrogen as cheap as or even cheaper than diesel and build out a network of filling stations that not only provides affordable hydrogen but also gets rid of our waste. Affordable hydrogen will soon be here. To me Hydrogen is really the way to go, but lets be realistic why does it always have to be little old UK that has to be first ? What about all the REALLY BIG third world Country's pumping out immeasurable amounts of CO2 ?! Ok, so we get rid of our Petrol and Diesel Cars, then they are sold of to Third World Country's,( as a large amount already are ) and we continue to pollute in a already contaminated further afield part of the Planet ! Yes I believe that hydrogen is the answer but lets not forget LPG or LNG, the only reason these o not do well is because of the reducton in tax benifit, which will happen to EV and probably hydrogen vehicles which can be added to whay was road fund duty. The question of selling off to 3rd world counties would only last for a decade as supply would soon run out so is not a great worry and some 3rd world counties are using LPG. It would be a lot easier to refuel a hydrogen car than an electric one, without delays finding a charging point then waiting for the damn thing to recharge. It's all very well saying you can recharge an electric car overnight at home but what if you live in a flat and have to park in the street away from where you live? Electric is totally useless. Everyone is quick to point out the splitting H2 out either by electrolysis or other means is inefficient. However most seem to forget that setting up exploration rigs, then extraction oil and then refining in to by products such as Petrol isn't exactly super efficient. Hydrogen does make more sense for the way we use cars and there are an increasing number of initiatives that are refining the extraction process, such as solar and wind powered electrolysis plants. Plus you can distribute in much the same way as Petrol or diesel and modify existing Petrol station architecture to accommodate the pumps, so no need to design an entirely new infrastructure. It would seem to be a more logical alternative. I wonder, why battery has to be charged every time, why not have generators attach to all four wheels of the car to charge the battery and also photocell solar panels on the roof? It is possible but then where would the companies make money from? The government & companies will only adept the policy where one has to spend money to run the vehicle. You would waste more battery power than you would produce by trying to generate power when you are moving. You can charge the battery when you brake. For EV to work, you would need at least 350 miles in the cold winters for it to woek, but how many miles would one do on a full charge on a very cold evening with the radio, heated seats and streering wheel plus lights on, not far id imagine. I think if they could produce H2 faster and cheaper it would be very viable as a replacement for petrol and diesel engines. There's no such thing as a zero emission vehicle, they simply remove the emissions elsewhere, ie the power station. Am I being stupid, why can't you burn hydrogen in a modified internal combustion engine just like LPG? This would give a quick solution, maybe for the short term but achievable economically and we can continue to enjoy 300 - 600 miles between refills that take minutes rather than hours. John Hunt says that there is 1TWh of spare generating capacity. That is 1TWh or 1000GHh. A strange statement when the whole of the UK rarely uses above 45GWh. See me after school John Hunt. Heavy metal disposal. Access to power points. Range. National grid capacity. Recharge timeframes. Efficiency of power generation via fossil fuels or nuclear. Power generation capacity for circa 40 million vehicles. Need I say any more? When are rhe media and government going to realise that pure battery recharging electric vehicles is not the solution. If a tenth of the money and investment was made in hydrogen fuel production that's been spent on research into the emperors new clothes of electric vehicles, we'd have solved this issue by now. Whats more is the pure electric recharge lobbying doesn't address the use of fossil fuels in commercial and haulage vehicles. Yes electric will work in the city of Westminster bubble that the politicians live in - but nowhere else. I remember the very interesting course notes and project when my son did motorsport engineering at college in about 2007/8 and wondered whether this was another good solution suppressed by vested interest. It is a does seem a safe and realistic way forward that retains autonomy and practicality. The fashion for grid electric glosses over the pollution in production and future availabilty of electricity with abject failure to forward plan by our politicians. I seem to recall that BMW had a hydrogen powered car on test a few years ago and the biggest problem they had was that the hydrogen leaked out overnight. So it had to be refuelled every day. Oh one other thing, the article says that the only by product is water vapour, well I'm not so sure that's okay. After all global warming is supposed to come in part from increased cloud cover, and what are clouds made of? The petrol hybrid is probably the best available technology at present. Electric cars are impractical for the vast majority of motorists.. Hydrogen cars are far too expensive while hydrogen fuel is a pig to store and distribute. Toyota have got the technology right - their hybrids emit less CO2 than a comparable diesel, vastly less NOx, while particulates are virtually non existant. Probably the way forward. One of the key reasons that EVs are slow in gaining popularity is, clearly, range and charge-time. If only EV manufacturers and battery developers could collaborate to design a 'one-size-fits-all' EV battery! Then all the driver would have to do is drive into the petrol/charging station, position the car over a battery replacement space (just like in a car wash) and put the charge card in the slot. The spent battery is automatically replaced with a fully-charged battery, taking no more than 2 minutes, the cost is deducted from the card and you're all done. Similar time to filling with petrol. As this CO2 is at pressure it is ideal for injection into depleted gas fields. This process can be done at existing refineries and the Hydrogen distributed at existing petrol stations. The thing that nobody seems to consider about battery electric vehicles is, how do the thousands and thousands of people who live in towns cities or those who have no home parking charge their cars? Can we really expect local authorities or power companies to provide the massive infrastructure needed to allow charging at every roadside parking space - just think of the scale of this and the disruption caused by the necessary work! There's no chance when they can't even afford to repair the roads properly! This alongside the problems of limited range means that realistically battery vehicles are a total non- starter in the longer term. Ultimately hydrogen is the only practical answer. What I don't understand about hydrogen as a fuel is why do we need an expensive fuel cell? Hydrogen could be injected into cylinders as petrol and diesel fuels are currently, and burned in the same way as inflammable fuels are now. I dont think hydrogen is any more explosive than petrol. People could make their own hydrogen, but I doubt that they could compress and cool it to liquefy it to make a viable amount of fuel to go any further than further than an electric vehicle.